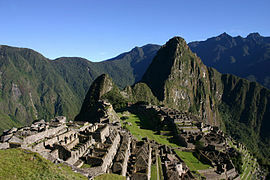 The Inca citadel of Machu Picchu in Peru was voted as the World’s Leading Green Destination for 2012 at the 19th World Travel Awards held in India. Elisabeth Hakim, Promperu tourism coordinator for North America and the UK said that besides Machu Picchu is known as an historic icon; it’s also a green destination as it has a great biodiversity. “Basically I think why we won it’s because Machu Picchu is very rich in biodiversity. You will find a number of orchids, fauna and flora, animals, birds. I think that is the reason why people recognize it,” she said. World Travel Awards is the most prestigious, comprehensive and sought after awards program in the global travel and tourism industry. Machu Picchu is the site of an ancient Inca city. This UNESCO World Heritage site is often referred to as “The Lost City of the Incas”, is one of the most familiar symbols of the Incan Empire, and is one of the most famous and spectacular sets of ruins in the world.